Layer half each of the potatoes and onion mixture evenly in 12 muffin cups sprayed with cooking spray; sprinkle evenly with 1/3 cup cheese. 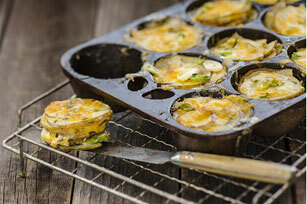 Top with layers of remaining potatoes and onion mixture; spoon milk evenly over ingredients in muffin cups. Top with remaining cheese; press cheese gently into milk with back of spoon. Cover with foil sprayed with cooking spray. Bake 30 to 35 min. or until tops of gratins are golden brown and potatoes are tender, uncovering after 20 min. Run knife around edges of gratins to loosen before removing from pan to serve. Place filled muffin pan on foil-covered baking sheet before baking gratins as directed. This will catch any milk mixture that might bubble over sides of muffin cups as gratins bake. Serve with hot cooked roast beef or pork tenderloin. The milk and the cheese team up in this delicious potato recipe to provide a good source of calcium.